(Ledru, 1993; Ledru et al., 1994; Servant et al., 1993; Su-guio et al., 1997; Behling and Lichte, 1997; Bush et al., 2000). These records identify possible mechanisms of past atmospheric circulation, including cold air outbreaks. Today, for the Southern Hemisphere, the Earth is farthest from the Sun in June (winter) and closer to the Sun in December (summer) (Martin et al., 1997). As a consequence, seasonal differences in insolation are strong with warm summers and cold winters, and the seasonal shifts of the Intertropical Convergence Zone (ITCZ) are strong. Equatorward extents of cold advections under present-day conditions are shown in Fig. 11A. In contrast, at ca. 11,000 B.P., for the Southern Hemisphere, the Earth was closer to the Sun in June and farther from it in December, resulting in relatively colder summers, but relatively warmer winters than now and reduced seasonality. As a consequence, the continent was not warming as much then as during today's southern summer, and the ITCZ was probably located farther north than it is today. A weaker ITCZ, on the other hand, would have helped cold advections to penetrate further equatorwards in spring and autumn and possibly even in summer (Fig. 11B). ical evidence, suggest climates colder than today during the glacial/interglacial transition. The most likely explanation is that polar air masses reached tropical regions more frequently during those times than they do today (Figs. 11A and 11B). Currently, climate in the region is influenced by polar outbreaks from the south only occasionally, but overall the climate is not cold enough to support the presence of either Andean forest elements or Araucaria forests in these lowland regions. Climatic conditions during full glacial times were apparently too dry and too cold for large Araucaria populations (Ledru, 1993; Ledru et al., 1994; Behling and Lichte, 1997; however, see discussion in Bush et al., 2000). Dry climatic conditions with reduced cloud cover might have favored frosts during winter nights. Cold air associated with cold fronts and polar outbreaks might have reached farther north and had a significantly stronger influence in southeastern Brazil during the last glacial maximum than it does today (see also Bradbury et al., 2000). Increases in temperature and moisture content of the air masses after 8000-6000 B.P., interpreted from pale-oecological records, are probably due to a reduction in the influence of cold fronts (Suguio et al., 1997). 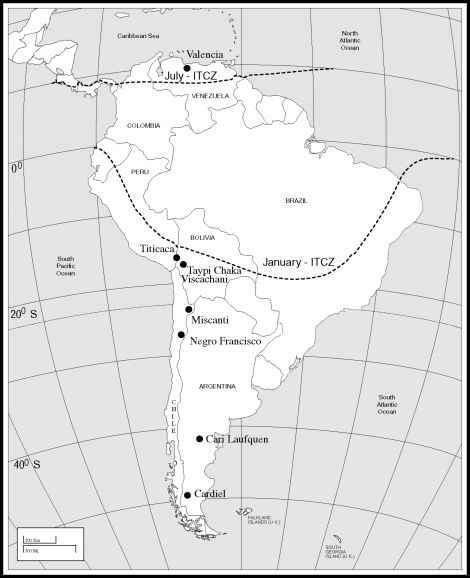 Thus, throughout the late Quaternary, variations in the intensity and trajectory of the polar outbreaks affected the climate of southern and southeastern Brazil.